The Lucky Longneck Llama 4-H Club participated in the 2005 Multiple Sclerosis Walk for a Cure in Salem, Oregon on April 16th. Our local paper included a note about our team in their write-up of the event. Club Service. The club participated with the Koenig's in the 2005 MS Walk for a Cure. This year the Koenig's and some club members groomed five animals then walked in the Multiple Sclerosis Walk on April 16th in Salem, Oregon. 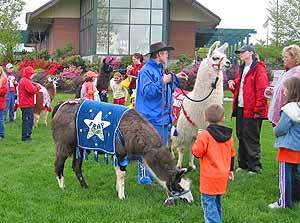 The walk went very smoothly, and five llamas on the sidewalks of downtown Salem caused many drivers to do double-takes! Fortunately, in spite of all the "rubber-necking," there were no auto accidents! After the walk we hung out in Riverfront park and visited with other participants. The weather was not great, but fortunately, it only rained lightly once during the walk. 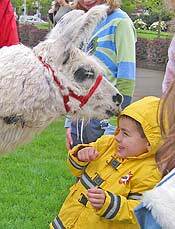 On the grass near the Carousel in Riverfront Park (above), the llamas gave some pets and, in some cases, kisses - see below. 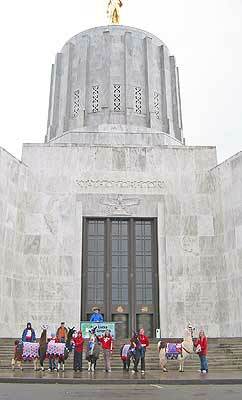 If you walk by the Capital building (left) with your llama, be sure to have your camera to record the event! 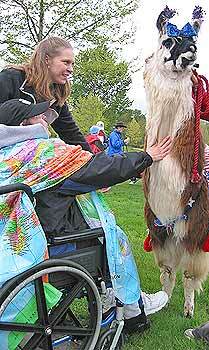 It's Destini (the llama in the picture to the left) interacts with some participants at the event. Gold Sparkle (the llama in the picture to the right) says, "But all I want is to kiss your forehead...," her young friend is not so sure if he really wants a llama kiss! For more information about the Club or Club activities, please e-mail Julie at Julie@KoenigLlamas.com .